8.G.6. Explain a proof of the Pythagorean theorem and its converse. 8.G.7. Apply the Pythagorean theorem to determine unknown side lengths in right triangles in real-world and mathematical problems in two and three dimensions. 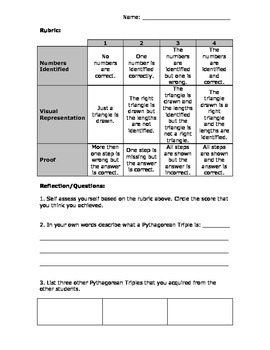 Objective: Student will prove that a grouping of three numbers is a Pythagorean Triple. Working in groups of 3 to 4 the students will. 1. Each group is given 5 numbers. 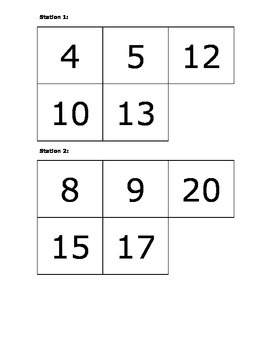 Match the three numbers together that satisfy the Pythagorean Theorem . 2. 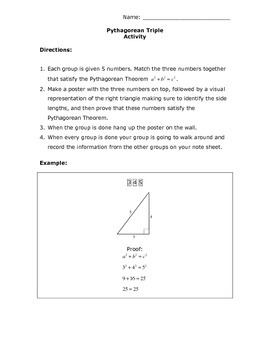 Make a poster with the three numbers on top, followed by a visual representation of the right triangle making sure to identify the side lengths, and then prove that these numbers satisfy the Pythagorean Theorem. 3. When the group is done hang up the poster on the wall. 4. 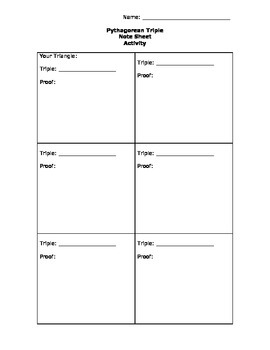 When every group is done your group is going to walk around and record the information from the other groups on your note sheet.